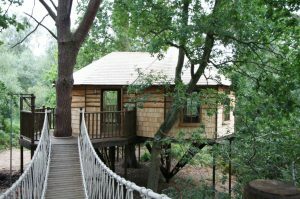 Blue Forest were asked to design a luxury tree house accommodation unit at Clowance Estate. This beautiful tree house has been expertly positioned to make the most of the beautiful setting, situated in the heart of Clowance resort, it offers exceptional views across the existing lake and back up to the magnificent Clowance House. 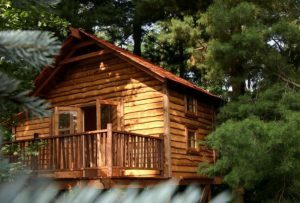 Perfect for a romantic getaway, this luxurious tree house sleeps up to 4 people in 2 beautifully designed bedrooms, which both offer breath-taking views over the surrounding countryside and woodland. The spacious open-plan living area benefits from plenty of natural light, a central dining area with a wonderful bespoke dining table as well as a fully-equipped kitchen which has a wonderful organic shape, that curves effortless with the tree house. The outdoor deck, which wraps around the tree house offers the perfect place to relax and unwind, either on the dining deck with a glass of bubbly, or in the private copper bath tub, where you can and enjoy the wonderful sights and sounds of the adjoining woodland whilst being shielded by rustic branch fencing. Luxury Lodges offer a range of special offers to help you get away from it all and enjoy a superb holiday. Take a look at the current offers and promotions. 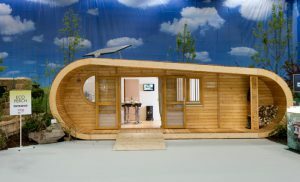 The Blue Forest ecoPerch is a wonderfully inviting retreat with the chic appearance and the household utilities of a modern ski chalet or cabin. Guests are treated to exclusive access to sustainable self-catering with this unmatched eco-living experience. The Riverbank Tree House is situated near a lake on the clients private estate. From this position the tree house commands views across the water and back towards the woodland on the far bank. The Armonia Naturale Tree House has all the charm of a snowy mountain chalet with the comfort and attention to detail of a Blue Forest luxury tree house.